MOSHE (AUS) (Bay or Brown 2007-Stud 2012). 3 wins at 1000m, MVRC Moreton Hire H., Mayoral Charity Community H., 4th ATC Fireball H., L. Brother to SW Black Caviar (Horse of the Year in Australia-twice. Royal Ascot Diamond Jubilee S., Gr.1). Half-brother to SW All Too Hard (MRC Caulfield Guineas, Gr.1). 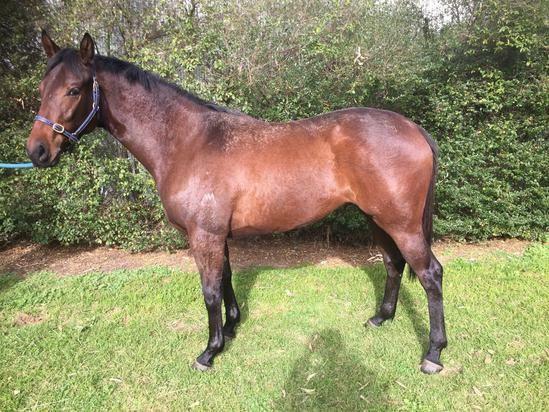 Out of a half-sister to SW Magnus and SW Wilander. Grandson of SW Scandinavia. His oldest progeny are 2YOs. PURPLE STORM, by Churchill Downs. 2 wins at 1200m, MVRC Cleanaway H., 3d MRC Swift Signs H., 4th MVRC William Crockett S., L. This is her second foal. Her first foal is a yearling. Two Hills. 7 wins-2 at 2-to 1400m, A$363,613, VRC Hyperno 2YO H., Secondbite P.H., MVRC Dr Sheahan P.H., MRC Ricoh H., Shankhill Lass H., 2d VRC Grand Archway 2YO H., MRC Cecil Godby 2YO H., BWS H., MVRC Eskander's Betstar 2YO H., 3d MRC Bill Collins H., Pamela Hutterer H., Over H., No Fuss Solutions P., Bendigo JC Catanach's Jewellers Gold Bracelet. Sergeant Hightower. 2 wins at 1200m, 3d MRC (Mornington) Nepean Waste H.
Burst Away. Winner at 1050m in 2015-16, SAJC Zebedee at Cornerstone P., 2d SAJC Guardian Insurance H.
Missvonn (Teofilo). 3 wins from 1200m to 1900m, A$177,200, to 2014-15, ATC Hyland Race Colours H., 2d ATC Adrian Knox S., Gr.3. Graphic. 13 wins to 1550m, A$135,285, AJC Sunnybrook Travelodge H., Sedgwick Abrahams H., ES Playfair Welter H., Birdcage Welter H., STC Soul Pattinson Trade Show Welter H., Truscott's Toyota Welter H., Truscotts H., 2d STC Strathfield Welter H., Willoughby Legions Welter H., 3d AJC Birdcage Welter H., Jack Jarvis Welter H., 4th AJC Liverpool City Cup, Gr.3. WINTER BURST (Western Winter). 5 wins-1 at 2-at 1200m, 1400m, R397,500, Kenilworth Prix du Cap, Gr.3, 2d Kenilworth Olympic Duel S., L-twice, 3d Kenilworth Fillies Championship S., Gr.2, Diana S., Gr.3. ECLAIR CHOICE (California Dane). 4 wins-1 at 2-to 1200m, A$219,580, to 2014-15, SAJC Redelva S., L, 2d Bendigo Guineas, L.
ZOUTENANT (Zizou). 2 wins-1 at 2-at 1000m, 1100m, A$194,000, to 2015-16, Wyong Magic Millions 2YO Classic, RL, 4th ATC Heritage S., L.
HISTORIAN (Choisir). 5 wins from 1400m to 2000m, NZ$757,550, ARC Zabeel Classic, Gr.1, WRC Thorndon Mile, Gr.1, Hawke's Bay Tumu ITM Spring Sprint H., Gr.3, ARC Auckland Co-Op Taxis H., 2d New Zealand Derby, Gr.1, ARC New Zealand S., Gr.1, Novotel Mile H., Cambridge Stud Yearling Draft 3YO H., 3d Waikato Guineas, Gr.3, 4th Avondale Guineas, Gr.2. EXCEPTIONALLY (Ekraar). 4 wins from 1600m to 2800m, A$509,677, VRC St Leger, L, 2d MRC Sandown Classic, Gr.2-twice. SUPERFLY (Rock of Gibraltar). Winner at 2, A$122,200, AJC Widden S., L, 3d AJC Gimcrack S., L.